Hiya guys! I know this past week has been kind of crazy for me schedule wise. I'll be doing a lot of posts the next few days to make up for it so don't you worry. Let everyone's wallets cringe and nails rejoice, haha. Today I'm sharing only one polish in this post, but it's a heck of a gorgeous one! 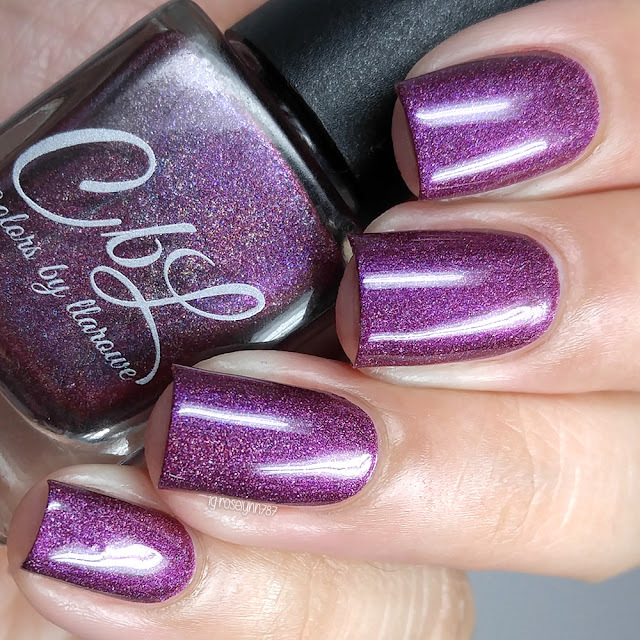 Introducing Fall is Coming, the October Polish of the Month from Colors By Llarowe. As with every PoTM, this shade is limited edition and a must-have. Colors By Llarowe will be releasing the October Polish of the Month on October 1st. Pre-order will be open for 24 hours, from 12:00pm Mountain Time until 12:00pm Mountain Time the next day. Each shade retails for $12.00 and will not be offered again once it's sold out. 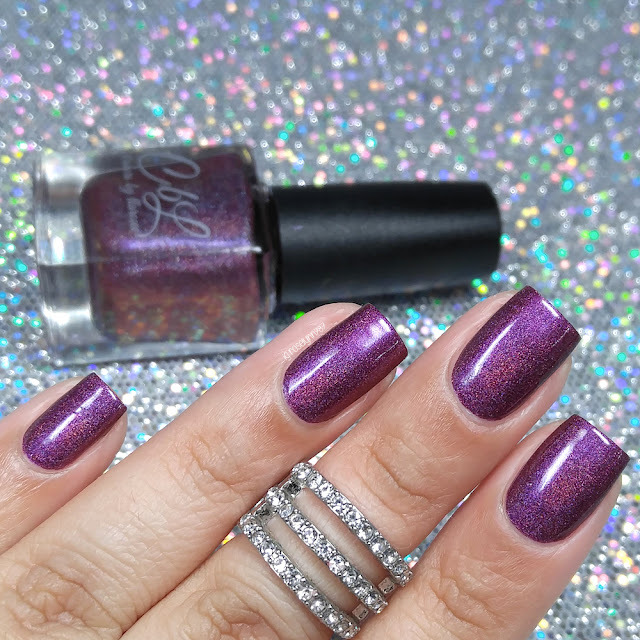 Fall is Calling can be described as a reddened berry plum linear holo with a pink to gold shift. This gorgeous shade is Fall in a bottle! The formula has a creamy smooth application with a great consistency, not too thick or too thin. This polish is extremely opaque and is pretty much a one coat wonder. That said, I do prefer to always do a second for good measure but that's a personal preference entirely. Now despite it's heavy pigmentation, I experienced no staining on removal without a base-coat after a few days of wear. Shown here in two coats plus a glossy topcoat. All of my photos are taken indoors in a lightbox so they don't do the holographic finish any justice. But if you're familiar with Colors By Llarowe holos, then you know they are quite strong and vivid in direct sunlight. Curse my night-time swatching not allowing me time to take photos during the day! As with all Colors By Llarowe shades... this polish ends up speaking for itself. The color is pretty much the photo definition of the word 'vamp' in polish world. Definitely a must-have in my opinion, not only is it a great color but a one-coater holo... come on! It's the perfect polish to embrace the Fall season with. To recap, Colors By Llarowe will be releasing the October Polish of the Month on October 1st. Pre-order will be open for 24 hours, from 12:00pm Mountain Time until 12:00pm Mountain Time the next day. Each shade retails for $12.00 and will not be offered again once it's sold out. Stunning swatches, Roselynn. Like, seriously amazing! I will definitely be picking this up! Your pics are amazing! This definitely is a must have! Absolutely perfect! You owe me a new laptop. Drowned my keyboard in drool because of these swatches. How do we go about ordering? And when would it ship? She always has the prettiest polishes! Gorgeous swatches! Thank you so much! So so beautiful, I can't get over how perfect your swatches are!